The Garrettford Drexel Hill Fire Company was first organized in January of 1907 as the Garrettford Fire Company. It started when a group of concerned citizens met in Summer’s Hall on the second floor of the old Scott’s Market, now the WaWa, at Burmont and Garrett. On April 12, 1907 the first firefighting equipment was purchased by the fire company, two Babcock Extinguishers. In 1908 the fire company applied for a charter. The charter was received on April 24, 1908. Also in 1908 the fire company purchased the Mission Building from the Garrettford Baptist Church. This building was located at Edmonds Avenue and Randolph Street; the fire company is still at this location. In 1910 the fire company obtained the first fire alerting system. It was a locomotive wheel donated by the Baldwin Locomotive Works. This wheel was struck with a hammer to alert the members that there was a fire. In 1911 a hand-drawn hose cart was purchased to go along with the ever-expanding water and fire hydrant system being installed in the area. 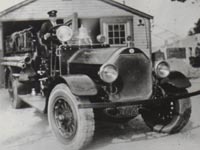 In 1913 a Mack fire truck was purchased, the first motorized apparatus for the fire company. In 1919 the first pumper was delivered to the fire company. It was a 750-gallon per minute (GPM) Seagrave engine. This truck, which was nicknamed “Old Bertha”, proudly served the community until 1953. Also in 1919 the community was expanding rapidly. To reflect this expansion the fire company also expanded its name and became known as the Garrettford Drexel Hill Fire Company. The 1920’s and 30’s were a slow period in our company’s history. In 1929 our present firehouse was built. In 1934 tragedy struck the Garrettford Drexel Hill Fire Company. James Verner, the chief of the fire company, was killed while directing fire-fighting operations. Mr. Verner had served as chief since 1913. 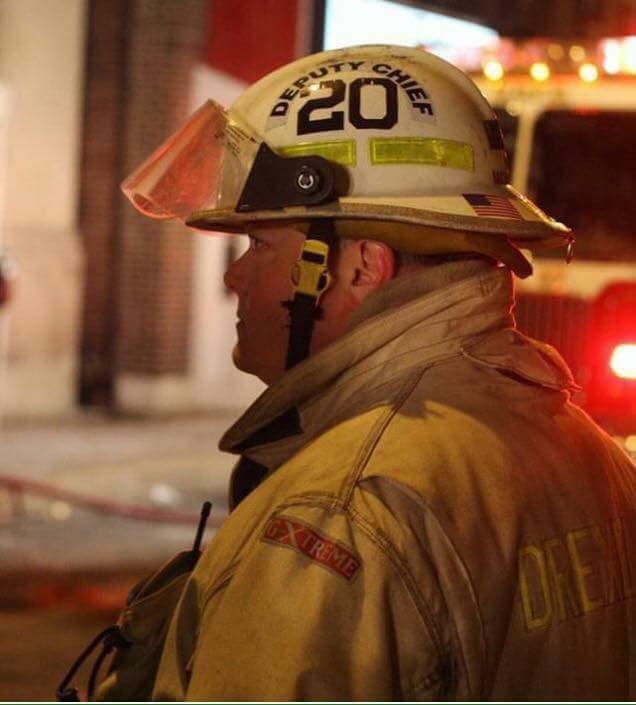 Chief Verner’s death was the first and only line of duty death to strike the Garrettford Drexel Hill Fire Company. 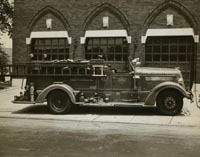 In 1937 the fire company purchased a Ford/Buffalo pumper. This truck served the fire company until 1960. The truck then went on to serve the Fair Acres Geriatric Center, in Lima Pennsylvania. The “Old Ford” as it is now know, was reacquired by the fire company and has been restored by the membership. The truck is now used for public relations and fire prevention programs. After World War II the community and the fire company were growing. The fire company received its first ladder truck a 1948 Seagrave. 1948 also saw the delivery of a Diamond T rescue truck. In 1953 the fire company placed in service a 750 GPM Seagrave engine. In 1956 a new member of the fire company arrived. The company’s first dog named “Belle”. “Belle” served the fire company until 1969. In 1957 to match our growing apparatus roster, a fourth bay was added to the firehouse. Seagrave 100′ ladder truck was placed in service. When originally placed in service this truck had both front and rear wheel steering. The driver turned the rear wheels by using foot pedals. This system proved to be a problem and was removed from the truck. The 1970’s did not see much in the way of major events for the fire company. The 1980’s did bring about more apparatus changes and two new dogs. In 1981 a GMC/ Pierce rescue truck and a GMC/Sutphen tactical unit were placed in service. Also in 1981 “Smokey” passed away. “Smokey II” joined the company in 1981 but fell to an untimely death. “Chief”, “Smokey II”‘s replacement arrived in 1981 and served until 1993. In 1984 the Hurst “Jaws of Life” were placed in service on the rescue truck. In 1987 a 1250 GPM Seagrave engine was placed in service. The 1990’s brought about several more changes to the fire company. The first major change to the original firehouse since the addition of the fourth bay occurred when the apparatus room floor needed to be replaced. The replacement of the floor caused the removal of the bowling lanes from the basement and had the apparatus in a plastic tent in the parking lot for several months. This upgrade of the floor allowed us to modernize the apparatus fleet in 1996 and 1997. In 1996 the company placed in service a 1500 GPM Seagrave engine and a 100′ Seagrave ladder truck with a 1250 GPM pump. In 1997 the fire company placed in service a Freightliner/PL Custom rescue truck, replacing the 1981 unit. On June 26th, 2016 we lost Deputy Chief Michael P. Morgan to a line of duty injury. He was a 32 year member of the Garrettford-Drexel Hill Volunteer Fire Company and a county dispatcher for 30 years. Mike represents the selfless sacrifice that all of the members of the Garrettford- Drexel Hill Volunteer Fires Company display every day in the protection of our community. His legacy lives on in all the Garrettford – Drexel Hill volunteers as we continue our proud history of service to Drexel Hill and the surrounding communities.